The Flu Is Scary This Year! You probably know someone—a family member, co-worker, or close friend—who has had the flu this year. If so, the chance that you will get the flu is very high. Halfway through the flu season, the CDC projects no end in sight. 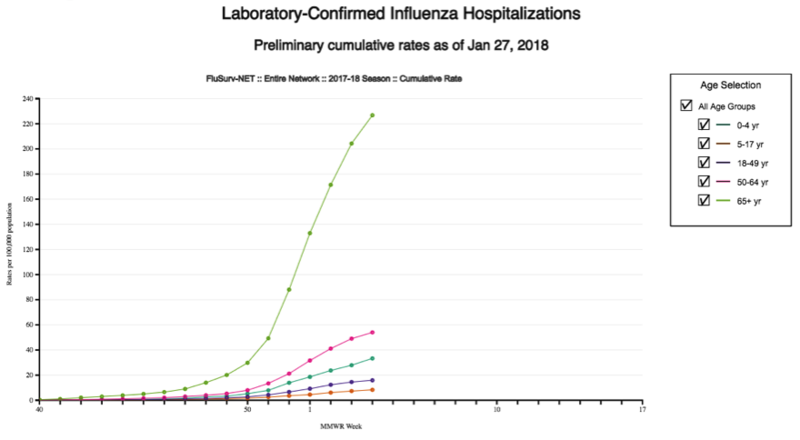 Compared to the flu epidemic of 2014-15 when over 710,000 persons were hospitalized and over 56,000 people died in the U.S., hospitalizations are up. This year’s numbers are alarming because they represent the most serious cases, chiefly among children and the elderly. They also foretell a higher risk of secondary infections that can prove lethal. Visits to urgent care centers and other outpatient clinics have also skyrocketed. The number one recommendation of authorities is for everyone (including children over 6 months of age) to get a flu shot. Several news outlets have reported that this year’s flu shot is not very effective against the H3N2 virus that is responsible for about 80% of cases. But even if an H3N2 infection is not prevented, the vaccine can still lessen symptoms and help prevent secondary bacterial infections. For more detailed information about flu shots, check out our previous blog post, 6 Myths about Flu Shots. Also check with your health care provider for answers to any questions or concerns you might have. If a person exhibits difficulty in breathing, a persistent high fever, dizziness or confusion, severe fatigue, or rapid heartbeat, seek medical attention. See a health care provider if an adult or child appears to get better and suddenly takes a turn for the worse since this can indicate a secondary infection. Last week a patient walked into our clinic and asked if we were out of the rapid flu test. We replied, “Yes we are, but we don’t always use the flu test to determine if a patient has the flu.” This test—the “rapid influenza diagnostic test” (RIDT)—is more accurate in detecting flu in children than in adults. But as the CDC points out, it can produce either false negatives (indicating no flu when a patient is actually infected) or false positives (indicating flu infection when there is actually none). Such inaccurate results depend on the strain of flu and the severity of the flu outbreak. 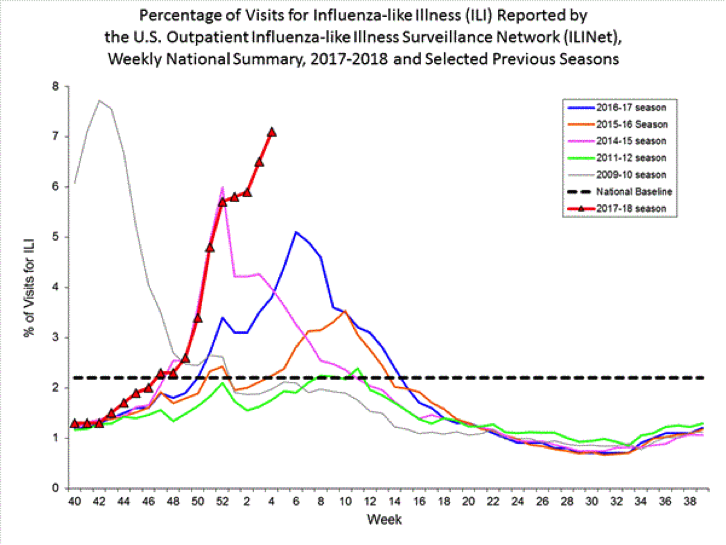 According to the CDC again, “Most people with flu symptoms do not require testing because the test results usually do not change how you are treated.” Bear in mind that health care providers see a lot of cases and are, therefore, very good at diagnosing the flu. That is why they often prefer relying on their own judgment. Symptoms of the flu and the common cold can also be confused. For more information about the difference between them and about the flu in general, see our previous post, Cold or Flu: How Can I Tell the Difference? These medications are not cures, but they can reduce duration and severity of symptoms. They are most effective if administered within 48-72 hours of the onset of flu symptoms. If you are in doubt about whether you or a family member has the flu, get checked out quickly. So far, at least 53 children in the U.S. have died, and flu mortality rates for all age groups are climbing. The flu is a serious threat this year. 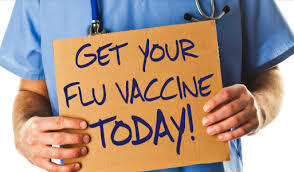 · If you or your family members have not yet received a flu shot, get one! The sooner, the better since it takes a couple of weeks for the vaccine to become fully effective. · If you suspect that someone has symptoms of the flu, get them checked by a health care professional within a day or two. · Urge others to get flu shots in order to limit spreading the flu. This is a public health matter. · Be cautious in public places, and wash your hands often. If you have any concerns about the flu for yourself or a family member, come to Kathy’s Urgent Care so that we can help you. We’re open weekdays from 8am to 8pm and on weekends from 8am to 5pm. Older PostWhat Will My Drug Prescription Cost?